Comm Eye Health Vol. 18 No. 53 2005 pp 73 - 75. Published online 01 March 2005. Consultant Ophthalmologist, Teaching Hospital, Kandy, Sri Lanka. Senior Lecturer, International Centre for Eye Health, London School of Hygiene and Tropical Medicine, Keppel Street, London WC1E 7HT, UK. The conjunctiva is a thin, transparent mucous membrane, which lines the inner surface of the eyelids and covers the sclera (the white part of the eye). The conjunctiva contains glands which produce secretions that help to keep the eyes moist, and antibodies, which reduce infection. Conjunctivitis means ‘inflammation of the conjunctiva’, and the commonest cause is infection by viruses or bacteria. Conjunctivitis can also be due to chemical irritants, traditional eye remedies or allergy. It is usual for both eyes to be affected in infectious cases. The patient notices that the eyes are red and uncomfortable, and there is discharge which may make the eyelids stick together in the morning. The vision is usually not affected. On examination the eyelids may be slightly swollen, the eyes are red, and there may be some visible discharge. The cornea should be bright, and the pupils should be round, regular and react to light. Conjunctivitis due to infection occurs at all ages, but some of the less common causes affect particular age groups (Table 1). There is one form of conjunctivitis which can be sight threatening – that due to gonococcal infection. Table 1. Causes of conjunctivitis, and who is primarily affected. Several different viruses can cause conjunctivitis. Some, such as entero- and adenoviruses, can spread rapidly through communities leading to epidemics of conjunctivitis (e.g. Apollo red eye), while others primarily cause skin infections (molluscum contagiosum, herpes infection), and the eye can be infected if the eyelids are involved. This is an epidemic form of conjunctivitis which almost always affects both eyes. The patient may complain of a foreign body sensation, with watering, discharge, redness, and swelling of the lids. They may also complain of the eyes being sensitive to light, with blurred vision. The eyes appear red, with discharge, but the cornea and pupil are usually normal. In severe cases there may be small haemorrhages in the conjunctiva. The patient may also complain of upper respiratory tract symptoms and other generalized symptoms (sore throat, fever and headache). The eye infection lasts 7-14 days, and usually gets better on its own. The condition is very contagious: health workers should wash their hands after examining a patient and disinfect the instruments they have used. Treatment: There is no specific treatment for viral conjunctivitis, and the condition gets better on its own. Antibiotic eye drops prevent secondary infection from bacteria, and tetracycline eye ointment can be soothing. Topical steroid eye drops should never be given for conjunctivitis due to infection. Health education: The patient should be told that the condition is very infectious, that they should not share face towels, and should wash their hands regularly. In parts of the world where traditional eye remedies are commonly used, the patient should be advised not to use traditional remedies and needs to be told that the infection will get better. The virus that causes the skin infection known as molluscum contagiosum can also infect the eye, if the molluscum is on the eyelid. The patient (usually a child) presents with a single or multiple eyelid lesions, which are small, round, waxy, whitish, umbilicated nodules on the eyelid. The affected eye will be red, with some discharge. Patients with HIV/AIDS can have multiple lesions (Figure 1). Treatment: This condition does not get better on its own, and the treatment consists of removing the lid lesion, with a curette or other blunt instrument. Health education: Mothers and adult patients can be shown how to remove the skin lesions. Again, this condition is more common in children. The child presents with fluid filled vesicles on the skin around one eye, and a red, sore eye which may be sensitive to light. The treatment is topical antiviral eye drops or ointment (e.g. idoxuridine, acyclovir). Health education: Steroid eye drops should never be used as they make the infection much worse. Conjunctivitis due to bacteria differs from infection due to viruses, as it is more likely to affect only one eye, and the amount of discharge and lid swelling is usually greater. The patient complains of irritation, a foreign body sensation, and the eyelids are stuck together in the mornings. Treatment: Broad-spectrum topical antibiotic such as tetracycline eye ointment. Certain groups of individuals are at risk of a very severe form of bacterial conjunctivitis due to the Gonococcus organism (which causes gonorrhea): i) newborn babies, who acquire the infection during delivery; ii) adults, who acquire the infection during sexual activity; and iii) individuals of any age who have used urine infected with Gonococcus as a traditional remedy. Taking a history is, therefore, very important. 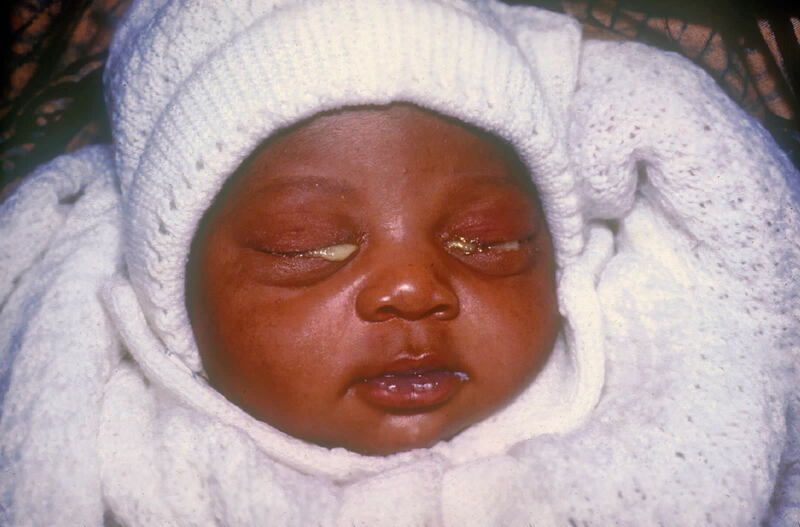 Infection with Gonococcus should be suspected in any age group (including babies) if the eyelids are very swollen, if the discharge is thick and profuse, and if the cornea is ulcerated or perforated (Figure 2). Treatment of babies: Clean the eyelids, and show the mother how to do this. Gently open the eyes, and instill tetracycline eye ointment, or other antibiotic eye ointment, showing the mother how to do this. Make sure she can instill the ointment, give her a tube of tetracycline (or other antibiotic), and tell her to put it in both eyes every hour. Tell the mother that this is a very serious infection, and that she and her baby should go urgently to an eye department as she and her baby need an injection of antibiotic. Treatment of adults: Prescribe antibiotic eye drops or ointment, and tell the patient to use the treatment hourly. They should be told that the infection is serious, and that they should go to an eye department. Health education: If a newborn baby has conjunctivitis and Gonococcus is suspected, the mother should take her baby to an eye clinic immediately for treatment. She should also should be treated as well as her husband/partner. Communities should be warned of the potential dangers of traditional eye remedies, particularly urine, which may have come from someone with gonorrhea. Bacterial infection of the eyelid margins can lead to chronic conjunctivitis. The patient complains of sore eyelids and sore eyes with little discharge. On examination, the eyelid margins are thickened, slightly inflamed and crusty. The eyes themselves may look normal or slightly red. Treatment: As the source of the conjunctivitis is infection of the eyelids, treatment is aimed at the eyelids and consists of tetracycline eye ointment applied to the lid margins three times a day, after cleaning the lid margins to remove the crusts. Chlamydia are organisms which have some characteristics of viruses and some of bacteria. They can cause conjunctivitis in three groups of individuals: i) newborn babies, who acquire the infection during delivery; ii) children, who develop trachoma; and iii) young adults, who acquire the infection during sexual activity. The infection starts a few days after birth, and the mother notices that the eyelids are swollen and there is discharge. The baby may also have chlamydial infection of the lungs, ears and nose. Treatment: Clean the eyelids, and instill tetracycline eye ointment. Show the mother how to do this and tell her to instill the ointment four times a day. The baby should also have a course of oral erythromycin to clear the infection from other parts of the body. Trachoma infection principally affects children. The child may not complain of symptoms or may have some discomfort and discharge. On examination, the upper eyelids may be slightly swollen and drooping, and the eyes will be slightly red, with some discharge. The diagnosis is confirmed by everting the upper eyelid and examining the conjunctiva over the tarsal plate. Evert the lid by i) ask the child to look down; ii) get hold of the lashes of the upper eyelid; iii) place a narrow object, such as a matchstick 2-3 mm above the lid margin, holding it parallel to the lid margin; iv) fold the eyelid upwards, against the matchstick. The eyelid will then evert. 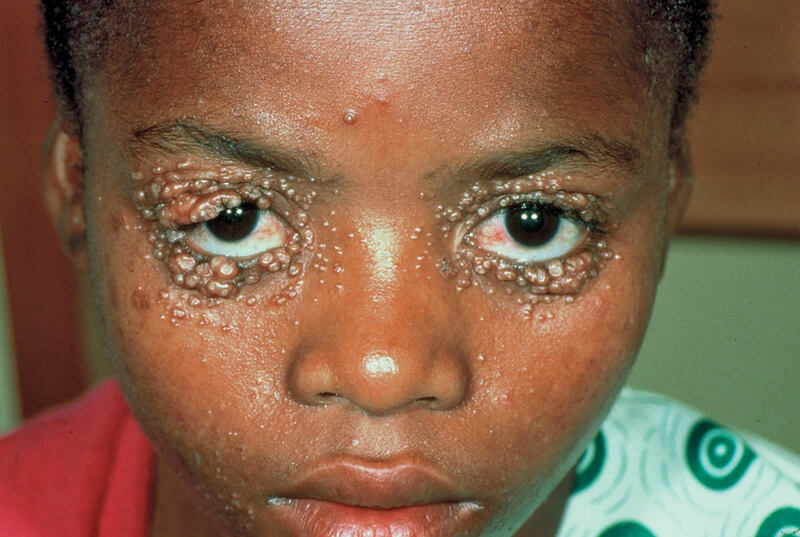 Active infection causes two eye signs: trachoma with follicles ‘TF’ (Figure 3), and trachoma with intense inflammation ‘TI’ (Figure 4). Treatment: The child should be treated either with topical tetracycline eye ointment, three times a day for six weeks, or they should be given a dose of azithromycin 20 mg per kg body weight. Health education: Trachoma is a community disease which affects disadvantaged households. Seeing a child with trachoma almost certainly means that there are other children from the same community who are infected, and there are likely to be adults requiring lid surgery. Health education should focus on the SAFE strategy (see Community Eye Health Journal Issue 52, 2004). There are two forms: an acute form and a chronic form. The adult or child develops sudden and severe itching of the eyes and eyelids as a result of coming into contact with something the person is allergic to (e.g. pollen, cats). The eyelids and conjunctiva become markedly swollen and there is profuse watering of the eyes, which usually do not become red. The condition gets better on its own very quickly. Health education: The person needs to try and find out what led to the reaction (e.g. eating certain food; sitting under a particular tree) and try to avoid this in the future. They should be told not to rub their eyes, as this makes the condition worse. The cause of vernal keratoconjunctivitis is not known, but it is often associated with asthma or eczema and is probably due to a longstanding allergic reaction. The condition usually starts between the ages of three and 25 years, and the patient complains of chronic itching, a thick, clear, stringy discharge, light sensitivity, blurred vision and discoloration of the eyes. The diagnosis is made by everting the eyelids when large, flat ‘papillae’ become visible (Figure 5). Treatment: Treatment is not easy at the primary level, and if the symptoms are severe, or the cornea looks hazy, the management is referral to an eye department (see pages 76-78). Many different substances put in the eyes can cause chemical reactions (e.g. traditional remedies, reaction to the preservatives in eye drops). The findings are similar to that seen in viral conjunctivitis, and so the history is important. Treatment: The person should be told to stop instilling the substance that has caused the reaction. Tetracycline eye ointment can be soothing and will prevent secondary bacterial infection. Health education: People should not instill anything in their eyes that has not been prescribed for them, and they should throw away eye drops after the bottle has been open for one month or more. Conjunctivitis is common but is only rarely sight threatening. However, accurate diagnosis and prompt treatment at the primary level is very important as it instills confidence in the community, and reduces the risk that people may first try traditional remedies, which can, and do, lead to blindness.